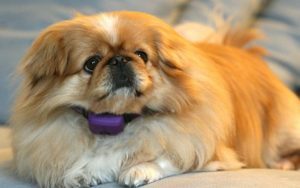 PetPace smart collar gives a better picture of total pet health and wellness. Your pet’s body must maintain a relatively constant internal environment, called homeostasis, to ensure proper physiological processes. One of the main components of homeostasis is the temperature. This is the reason why measuring a dog or a cat’s temperature is always a part of any medical assessment. The finding of an abnormal body temperature, e.g. fever, is an indication that something is wrong and warrants further investigation. Since pets can’t talk and complain when they feel bad, monitoring temperature, together with other vital signs, becomes very helpful in detecting diseases and monitoring their progression and response to treatment. Everyone can theoretically monitor the temperature of his or her dog or cat at home. However, this is unlikely to happen since nobody, including both pets and owners, don’t like the measuring method involved. A non-invasive yet continuous method of monitoring pets temperature would therefore be of significant value in preventive medicine and monitoring of dogs or cats for the risk of developing medical conditions associated with an abnormal temperature, from heatstroke to fever episodes and more.